The Louis Garneau Men's Tri Power Lazer short make every mile that much easier, providing a compressive fit designed to support the body in motion. Designed for the male body, the Tri Power Laser Shorts reduce fatigue by improving circulation, featuring a tri-specific chamois that provides the optimal amount of padding while riding, but disappears during the run or swim. Constructed from the ever-popular Lycra Power fabric, this material boasts a more complex knit that packs more lycra-per-square-inch than the competition. Providing more stretch and better muscle support, these shorts also offer compressive properties, preventing blood (and the lactic acid it carries) from staying in over-worked muscles, increasing resistance to fatigue by 10 to 20% over a long duration. 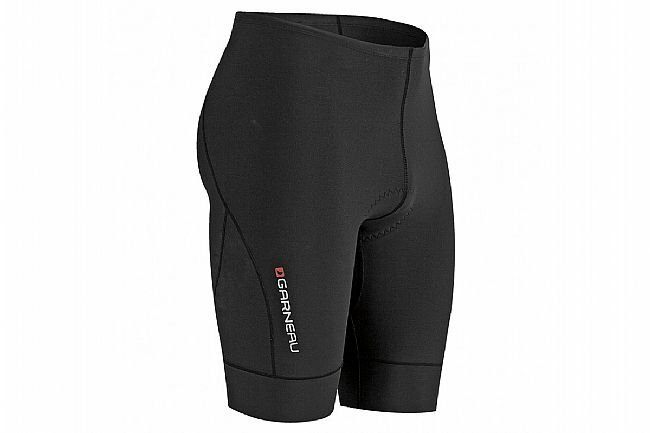 Finishing the 10.5" inseam short, Louis Garneau uses a heat-reflective coldblack® treatment to keep temperatures low even as the intensity increases. The Men's Tri Power Lazer shorts use an 8-panel design joined with flatlock seams, designed to eliminate chafing while providing the optimal amount of support. With the Tri Air chamois, the short conforms to the body throughout a wide range of movements to prevent it from getting in the way during the swim or run. To further this comfort, Louis Garneau implements their Crotch Flex Panel, preventing the shorts from bunching and pinching in the saddle.